I smiled when I read that National Geographic nicknamed Dublin “Europe’s largest village” and had made their List of Places You Need to Visit in 2018 . After having just visited here in December – we totally agree! Dublin’s got a youthful, energetic, small town college vibe – which is amazing because there are 1.2 million people who live there. 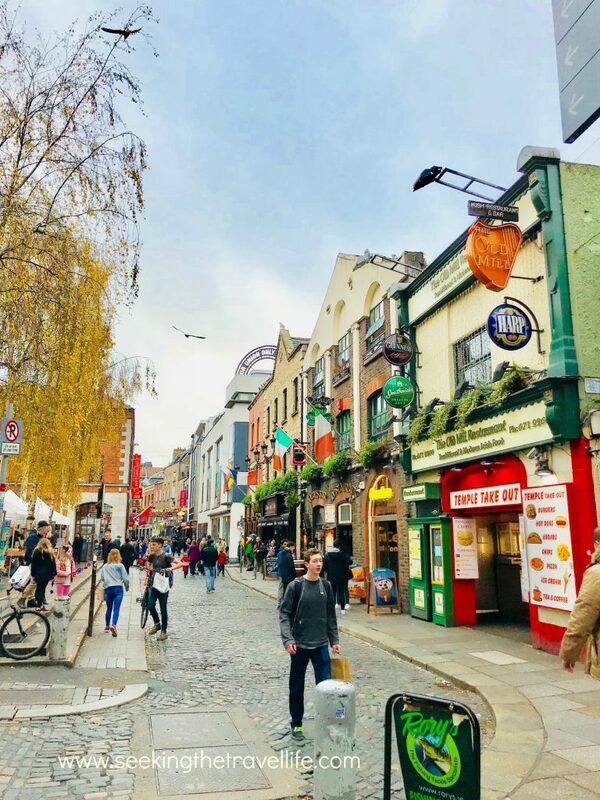 The best part about Dublin is that the people are friendly, the historic part of town is very walkable, and you’ve got some really awesome pubs and food choices. They also have a great music and theater scene. There’s no shortage of things to do in this town! If you have only 1, 2, or 3 days to visit Dublin, it’s okay! We’ve got you covered. We’ve included suggested itineraries, and all the things we enjoyed while in Dublin (including hotel recommendations). Here is our first-timer’s guide to Dublin – when short on time… happy travels! Dublin Castle. Tour the inside, the underground part of the tour is really interesting! National Museum of Archeology. Make sure to check out the Bog Bodies, Cross of Cong, and Ireland’s Gold. Little Museum of Dublin and City of a Thousand Welcomes, Meet a Dubliner Program (More Info). Their Meet a Dubliner Program is very popular. If you are interested in meeting a Dubliner over coffee or a drink at a pub you’ll need to book earlier. Tour of the Guinness Storehouse, (More Info). Picnic in St. Stephens Green or the “secret” park behind Dublin Castle (or maybe both, LOL) :-)! Dublin City Bike Tour, (More Info). If you’re short on time tours are a great option. If you go by bike, you can cover much more ground in a shorter period of time. Oh, and did I mention that the Irish are awesome storytellers and make this super fun? Dublin Docklands and the Bord Gáis Energy Theatre. The Dublin Docklands are a really hip and trendy part of Dublin. Seeing the architecture at night, as well as a theater/concert performance at the Bord Gais Theatre, followed by a night cap in one of the nearby pubs is an amazing way to end the day. Fish and Chips from Leo Burdock Fish and Chips, (More info here or here) A taxi driver told us this is the best fish place in town – he was right!! Order the Smoked Cod and Chips. REALLY good stuff! As with most big cities, being centrally located and convenient to everything comes with a price. Hotel rooms in Dublin can be expensive. You pay for the convenience. Every hotel we recommend has very good ratings, is conveniently located, offers breakfast, and are quiet. Radisson BLU Royal Hotel Dublin, (More info, or to book) We stayed here and highly recommend it. It is clean and quiet, centrally located, they have an awesome breakfast bar, and you can easily walk to every place you want to see. Dublin Docklands/Bord Gáis Energy Theater. That’s it! Be sure to let me know how you enjoyed your trip! Feel free to email me or post a comment – we would LOVE to hear from you!